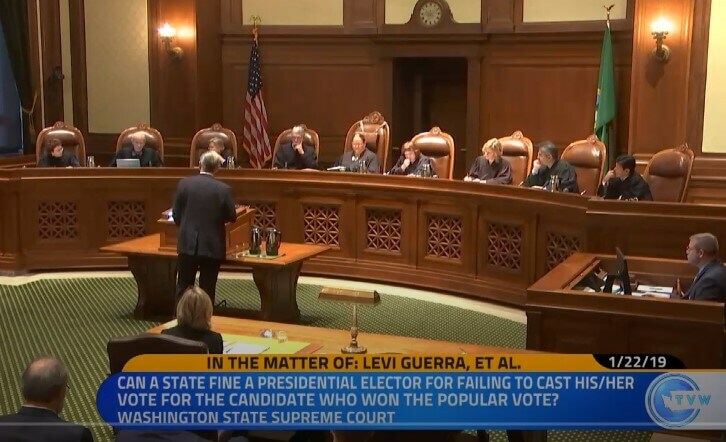 Today the Washington Supreme Court held oral arguments in In the Matter of: Levi Guerra, Esther v. John, and Peter B. Chiafalo, a case with potential national implications for the Electoral College System. This case, along with the Colorado case of Baca v. Hickenlooper that will be argued on Thursday in the Federal 10th Circuit Court of Appeals, challenge penalties faced by presidential electors after they failed to vote for the presidential candidate for whom they had pledged to vote. 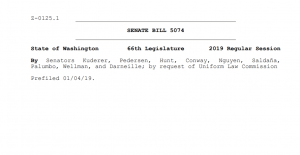 Here in Washington, the question presented was whether the three named electors had the right to “vote their conscious,” in this case, refusing to vote for Hillary Clinton after the 2016 general election, after having pledged to do so upon their appointment as electors. Guerra, John, and Chiafalo were then each fined $1000 by the state for violating their party’s voting rules. In the Colorado case, the elector was removed and replaced when he indicated he would vote for an alternate candidate. In arguments today, the lawyer for the Washington electors, Harvard Law professor Lawrence Lessig, argued that as originally understood, the federal government gave the states the power to appoint electors that were not mere agents of the state, but who were “choosers.” The state may ask them to make a pledge as to their intention, but if after their pledge if electors change their mind, that is their constitutional right. 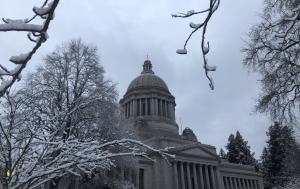 The State of Washington, represented by Assistant Attorney General Callie Castillo, argued in opposition that electors in fact represent the will and serve merely a ministerial function on behalf of the state. She asserted that the power to appoint electors was given to the state, and states have the power to regulate that however they may see fit, whether by enforcing it by fine, nullification, or removal. These cases sprang out of a movement in the Electoral College after the 2016 election dubbed by some as the “Hamilton Electors” after Alexander Hamilton’s Federalist Paper No. 68. The movement, co-founded by Washington plaintiff Bret Chiafalo, aimed to convince 37 Republican electors to cast their electoral vote not for Donald Trump, but for another, more moderate Republican in an effort to block Trump’s election as President. While the court did not reach a decision today, eyes will be on Washington as several similar “faithless elector” cases wind their ways through the courts. In addition to the 10th Circuit, cases have been brought and dismissed as moot in Minnesota and California which may indicate a case with U.S. Supreme Court implications. And as we move deeper into the 2020 election cycle, the issue may likely arise again.